“Age of Swords” is the second book in “The Legends of the First Empire” series. It is written by Michael Lawrence, author of the fantastic “Riyria Revelations” and “The Riyria Chronicles” series. The first book in this series was “Age of Myth”. 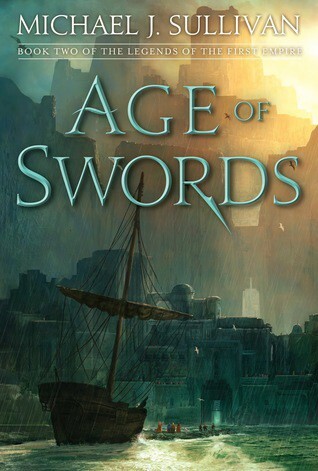 “Age of Swords” continues the story of our favourite characters — Persephone, Suri, Roan, Brin etc. The preparation for the war continues. Our heroes try put together a coalition. There is a quest to a new land. Let’s start with the character development. Suri’s and Mawyndule are the two characters who evolve the most in this book. Other characters like Roan and Brin continue on the same path as before. They have a lot of things to do but they don’t necessarily grow as much. But, all the characters are still fresh and interesting. Next, we come to the world building. We get to see new lands — specifically, the land of the Dherg. New beasts are introduced which adds to the richness of this world. This book is quite fast. The pacing is not break neck like in some other books but it is still fast enough to keep me engrossed. I was constantly turning the pages to find out what happened next. There were a few dead spots in the book where my eyes glazed over. Finally, we come to the plot. There were a couple of twists that I did not expect. But for the most part, the plot while reasonably predictable, was interesting. Michael Sullivan’s writing is excellent and kept me engrossed even when I knew what would happen. There were two things that I didn’t like. The first was the ease by which the protagonists were discovering/inventing stuff. I am prepared to live with this under the assumption that we will get to know why this was so easy for them, later on in the series. The second issue was the use of “cute” words like “ryte” and “scrybe” to denote a devolution in language. I felt this was unnecessary and didn’t really add to the authenticity of the story. There is a lot of potential in this series. I look at this book as a set up for the genre bending that we have promised. This is a fantastic read — I recommend it to all readers of fantasy.